William Henry Hallett was born in Trinity, Yeovil, in late 1883. He was the son of leather parer Henry Hallett (b1854) and Charlotte Eliza née Best (b1849). William was baptised at Holy Trinity church on 12 December 1883. At this time the family were living in Stars Lane. Henry and Charlotte later moved to 12 Union Street. In the 1911 census Henry and Charlotte were listed at Union Street with their sons William, James (b1885), Gilbert (b1889) and Percy (b1896). There was another son, Frank (b1894) who was not living at home. William, age 28, was working as a gas stoker at the Corporation Gas Works. William enlisted at Yeovil, joining the 7th (Service) Battalion, Kings Own Yorkshire Regiment. His Service Number 18938 suggests he enlisted during late 1914. On 22 July 1915 the battalion was drafted to France and landed at Boulogne-sur-Mer. The battalion was engaged in no major battles, but fought in the day-to-day attrition of the Western Front. One notable action the 7th Battalion was involved in was on 16 August 1917 when Langemarck was retaken. The village of Langemarck which had been lost the the enemy in April 1915, was retaken on 16 August 1917 by 61st Brigade, 20th (Light) Division. They crossed the Steenbeek early in the morning with 7th Kings Own Yorkshire Regiment and 7th Somerset Light Infantry leading. The advance was held up by fire from the blockhouses to the west of the village, these were cleared by men of the 7th Kings Own Yorkshire Regiment. On 20 February 1918 the 7th Battalion was disbanded and, while he was still in France, William was transferred to the 2nd/4th Battalion (Territorial Force), King's Own Yorkshire Light Infantry, part of 62nd Division. His Service Number was 18938. On 19th July 1918, 62nd Division took up a position on the right bank of the River Ardre, from Marfaux to the Bois du Petit Champ at Courmas. 185th Infantry Brigade, 2/5th West Yorkshire Regiment and 8th West Yorkshire Regiment the lead battalions, 1/5th Devonshire Regiment in support and 187th Infantry Brigade, 5th King's Own Yorkshire Light Infantry and 2/4th York and Lancaster Regiment the lead battalions, 2/4th King's Own Yorkshire Light Infantry in support, attacked at 8am on 20 July 1918. The covering barrage was supplied by French and Italian Artillery as the 62nd Divisional Artillery was still in the process of moving up. The battle was known as the Battle of the Tardenois, 20 to 31 July 1918. William was severely wounded on the first day of the battle and died from his wounds on 21 July 1918. He was aged 35 (not, as the CWGC would have it, aged 44). The Western Gazette reported "Mr and Mrs H Hallett, of 12, Union Street, have received the sad intelligence that their son, Private W Hallett of the King's Own Yorkshire Light infantry (who was recently wounded) has succumbed to his wounds. The distressing information was conveyed to the bereaved parents in a letter from Lieutenant J M Wilson (dated from France on August 8th),which states: "It is with deep regret that I have to write this letter to you with reference to your son, Private W Hallett, who died of wounds on July 24th [sic]. I must say he was a good soldier and very attentive to duty. Everyone in the company join with me in sending their deepest sympathy to you in your sad bereavement. This information would have been forwarded sooner, but nearly all the company officers were casualties." The deceased was well known and highly respected in the town, and the occasion of his untimely death has been marked by the receipt of numerous messages of sympathy by the bereaved parents. The deceased joined the Army at the outbreak of hostilities, and had served in France about three years. He was formerly employed at the Corporation Gas Works, and be remembered as a local footballer. The late Pte Hallett has a brother still serving in HM Forces and the other three brothers have been discharged." 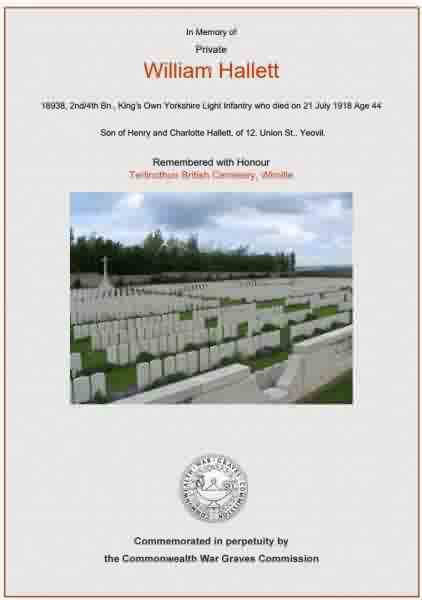 William Hallett was interred at Terlincthun British Cemetery, Wimille, Pas de Calais, France, grave XVII.A.26. His name was added to the War Memorial in the Borough in 2018. The record of William's baptism on 12 December 1883 at Holy Trinity church. The Commonwealth War Graves Commission certificate in memory of William Hallett.